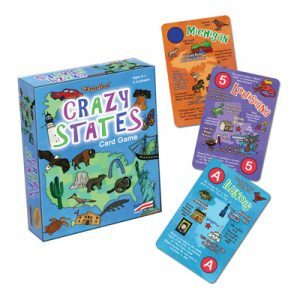 Enjoy a fun twist on the game, Crazy 8’s, by playing Crazy States! Each card features a different U.S. state. Filled with illustrations and fun facts from our 50 states. Oversized cards. 2017 Creative Child Magazine Game of the Year award winner.